Finding the hidden meanings. Unraveling mysteries. Deciphering symbols. The thrill inherent in all this is partly why Dan Brown’s book, the Da Vinci Code, sold so well. But Brown’s secret code, the 2000 year chain of clues supposedly leading to the true identity of Jesus and his holy grail, is simply a parody of the real mystery embedded in history. The writer of this authentic code is the Holy Spirit and the code book is the Bible. For thousands of years people have “searched the Scriptures” under the guidance of the same Spirit who inspired them, looking for connections between people, places, things. They’ve discovered one coherent story of salvation history amidst many different books, written in different genres and styles, by many different human writers over the course of centuries. This Sunday, the Church has put together readings to bring out connections that many of us would fail to see without a little help. 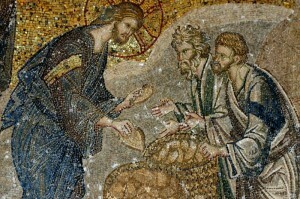 Just about every Christian has heard the story of the multiplication of the loaves and fishes, in fact numerous times. But we’ve probably overlooked the fact that they were barley loaves. What significance could that have? Plenty. First of all, someone in the Old Testament had multiplied loaves, and they too were barley loaves. Elisha was the successor of Elijah, the greatest of all the prophets. Elijah had multiplied flour and oil to save a widow and her son from starvation. Elisha did a bit better than his master, multiplying 20 barley loaves so as to feed 100, with some even left over. But in the Gospel, Jesus multiplies 5 barley loaves and feeds 5,000, leaving 12 baskets left over. We’re talking serious one-upmanship here. So here’s one clear message: Jesus is a prophet greater than even Elijah and Elisha. But there is someone else who is referenced here, though you have to look a bit harder to see him. Did anyone else in the Old Testament provide bread for God’s people in the wilderness? Of course! Moses and the manna. What is the symbolic number associated with Moses? There are five books of Moses which are called the Torah or Pentateuch. No wonder Jesus starts with five barley loaves. He is transforming the Mosaic Law into something much bigger, greater, and more nourishing. Moses predicted that God would raise up a prophet like himself (Deuteronomy 18:18). The people got the point–Jesus had to slip away to avoid them making him king (John 6:14-15). But let’s get back to those barley loaves. There is even more symbolism here to probe. Barley is the first grain to be harvested in the spring, and the feast of unleavened bread celebrates the first fruits of the barley harvest. Jesus performs this miracle as Passover approaches, and will go on later in John 6 to explain that he himself is the bread of life. The miracle of the loaves points backwards to great events in the Old Testament to give us clues as to who Jesus really is. But it also points forward to the future, to what Jesus will do in the upper room on the night before he died and which will made present again in every Eucharist. The people recline where there is much grass, verdant pastures (Psalm 23), and the Good Shepherd, after giving thanks (eucharistia in biblical Greek) feeds them with rich fare that causes their cup to run over with blessings of not only earthly satisfaction, but eternal life. How many baskets of scraps are left over? Twelve, the mystical number symbolizing God’s people. Twelve tribes, twelve patriarchs, and now twelve apostles, the patriarchs of the New Israel gathering up the remnants of a feast that will be the new covenant meal of God’s new people, the celebration of their deliverance, the new food for the journey to the true promised land, heaven. But how about the fish? What do they symbolize? You’ll have to do some research and figure that one out for yourself!